To close the 2015 carnival season, 10 members of the ski team competed in the National Collegiate Men’s and Women’s Skiing Championships held on March 11-14 at Lake Placid, New York. 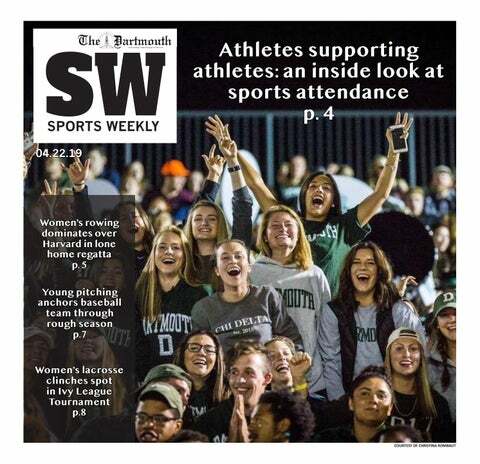 After four days of competition, Dartmouth finished in sixth with 275 points, while the Big Green’s Eastern Conference rival University of Vermont placed fourth with 443 points. The Western region schools showed their dominance as the University of Colorado at Boulder earned its 20th national title with 505 points, and the University of Denver and the University of Utah placed second and third, respectively. The men and women’s Nordic freestyle opened the championships at Mt. Van Hoevenberg. The men’s Nordic squad gave an outstanding performance in the 10K freestyle as Patrick Caldwell ’17 won the individual title and earned first-team All-America honors in the event with a course time of 25:09.1 to defeat the Denver Pioneers’ Moritz Madlener by 2.2 seconds. Madlener was the first to start the race while Caldwell was the last in the field of 40 competitors. Before Caldwell began, the closest competitors to Madlener’s first-lap time of 12:14.0 were Colorado’s Rune Malo Oedegaard and Mads Ek Stroem. Caldwell, though, managed to surpass Madlener’s first-lap time by eight seconds and narrowly beat his overall time when he reached the finish line. Silas Talbot ’15 earned second-team All-America honors with his eighth-place finish in 26:24.2. Fabian Stocek ’17 completed the course in 27:10.7 for 24th-place, giving the men 70 points total and a second-place finish in the event. On the women’s side, Corey Stock ’16 completed the 5K freestyle course in 15:16.4 for 13th place, and the Big Green ended the day with 88 points. With first and second-place overall finishes in the men and women’s Nordic freestyle, Colorado took a convincing lead from the start with 155 points. On the second day, the alpine teams took to Whiteface Mountain for the giant slalom races. Lizzie Kistler ’16 earned second-team All-America honors with her eighth-place finish in the event with a combined time of 2:25.30. Knowing she wanted to improve upon her 10th-fastest first-run time of 1:12.93, Kistler delivered a faster second run to improve her final placing and score 23 points for the team. Despite their success earlier in the season, Libby Gibson ’18 and Foreste Peterson ’18 had trouble completing the race as both fell during their first runs. The University of New Mexico’s Mateja Robnik won the event in 2:22.56, and the University of Denver’s Monica Huebner and Kristine Haugen placed second and third to give the Pioneers the top finish in the women’s giant slalom with 71 points. In the men’s giant slalom, three competitors scored a collective 49 points for the Big Green. Dylan Brooks ’17 led the Big Green with second-team All-America honors for his 10th-place finish in 2:19.38. Kevyn Read ’18 and Ben Morse ’14 placed 13th and 22nd, respectively. Competing at Whiteface during NCAA Regionals, Brooks said, was a huge advantage and confidence booster heading into the NCAA Championships. “While we compete all season long against other Eastern schools, it is always interesting to see how you stack up against the Western guys you haven’t competed against all season,” Brooks said. Middlebury College’s Robert Cone and Christopher McKenna placed first and third respectively for a combined score of 74 points to give the Panthers a win in the event. The University of Utah pulled ahead of Colorado by the end of the second day with 241 points, leading the Buffaloes by four points heading into the third day. After a successful start on the first day, the Big Green Nordic teams took to Mt. Van Hoevenberg once again for the classic races, hoping to add to their score of 159 points. In the women’s 15K classic, Stock placed 20th with a time of 50:42.8 after holding off a last minute push by the University of Vermont’s Stephanie Kirk to finish ahead of her by one hundredth of a second. New Mexico’s Emilie Cedervaern won the race with a time of 47:40.3, and Utah’s Veronika Mayerhoffer placed second to add to the Utes’ 87 points in the event. Caldwell led the men’s Nordic team in the 20K classic with a 10th-place finish in 57:05.02 for second-team All-America honors. Talbot completed the course shortly after in 57:15.0 for 12th place, and Stocek finished in 17th place to give the Big Green 54 points in the event, bringing the Big Green’s score to 224 points at the end of the third day, putting them in sixth overall. Northern Michigan University won the men’s 20K classic with 85 points after its three skiers placed in the top 15. The men’s alpine team opened the final day of the NCAA Championships with a third-place finish in the slalom after placing all three Big Green skiers within the top 20. Read placed 11th with a combined time of 1:58.72, while Morse and Brooks finished in 14th and 17th, respectively, giving the Big Green 51 points in the event. One of the challenges for the skiers, men’s alpine head coach Peter Dodge said, is knowing that everyone’s score counts. Vermont’s Dominique Garand won the event in 1:55.03 after posting the second-fastest times in both runs. Denver’s Trevor Philp placed second in slalom for the second year in a row with a time of 1:55.20 to beat his teammate Espen Lysdahl who was unable to repeat as the national champion in the event and settled for third place. The women’s alpine team faced unfortunate circumstances in the slalom, as none of the skiers were able to complete their runs. Gibson and Kistler fell during their first runs, and Peterson fell in her second run after posting the seventh-fastest first-run time of 59.12 seconds. The team, Knight said, was dealing with ongoing injuries after all the hard falls they took in the giant slalom. Denver’s Monica Huebner won the event with a combined time of 1:56.52, and Vermont’s Kristina Riis-Johannessen, the 2014 national champion, placed second to help the Catamounts to a first-place finish in the event with 87 points over Denver’s 86 points. Despite a solid showing in the slalom races by Denver, last year’s national champions, Colorado had just enough cushion from the team’s performances in the earlier days to stave off the Pioneers. The Big Green retained its sixth-place spot at the end of the championship despite earning zero points in the women’s slalom. Still, New Mexico, who placed fifth, outscored the Big Green 402-275. Although the 2015 skiing season has just ended, the Big Green ski team is already looking forward to the 2016 season and addressing the necessary issues to ensure another strong performance in the Eastern Regional Conference as well as the NCAA Championships. Learning to balance the academic load amidst the athletic demands in skiing, Knight said, will be an important step going forward.